Cardio exercise is any exercise that raises your heart rate. Face it our bodies were made to move. And we all understand that to stay our muscles in form we'd like move them. This movement makes them stronger and stronger muscles make for a lot of economical and healthy body. Your heart is a muscle. Therefore operating it makes it stronger. A stronger cardio-vascular system means a lot of capillaries delivering a lot of O to cells in your muscles. This enables your cells to burn a lot of fat throughout each exercise and inactivity. Cardio exercise uses large muscle movement over a sustained amount of time keeping your pulse rate to a minimum of five hundredth of its most level.Sample cardio workouts would be walking, running, bike riding, and aerobic workouts. Workouts should cause moderate sweating. If you can’t finish a sentence whereas doing your physical exercise you're going at it too laborious. If you are having no hassle talking step it up. You need a minimum of twenty minutes of continuing elevated pulse to urge the simplest resultsa minimum of three times every week. The American school of Sports medication recommends half-hour of moderate intensity physical activity most days of the week. Cardio exercises will burn fat. Weight loss comes from burning more calories than you take in. Even when you see no specific weight loss you're obtaining nice edges from a cardio physical exercise. Benefits: Weight Loss Stronger Heart and Lungs exaggerated Bone Density Reduces Stress higher Sleep a lot of Energy Reduces the Risk of cardiovascular disease Teaches the guts to figure a lot of expeditiously Strengthens Heart & Lungs Increased Energy Levels for a a lot of Active manner Reduction in Mood Swings & Depression so as to feel sensible currently and within the future you would like cardio exercise. It will not produce six pack abs or tone downside areas however it'll build your body a lot of economical in your day to day living. 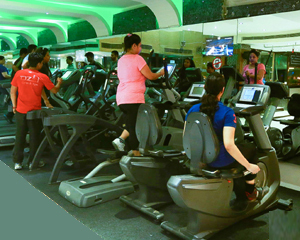 Join Ozi Gym, the biggest gym chain of tricity with international facilities like CrossFit, Gym, Cardio, Spa, Aerobics & Yoga. Call 0172-5020033 or 0172-5020888 for latest offers. Now in Chandigarh, Mohali & Panchkula.